Ideal for Brands and Publishers seeking to reach their customers on the fastest growing social network. MENLO PARK, CA – February 12, 2018 – SimpleFeed today announced the addition of Instagram publishing and analytics to its Social Syndication Hub, a leading enterprise digital publishing solution. Brands and media companies are increasingly eager to connect with their customers on Instagram, the fastest growing social network. SimpleFeed addresses the content management and reporting challenges faced by major corporations as they scale their Instagram presences. The Social Syndication Hub automatically imports images and videos from across the enterprise for curation and publishing. 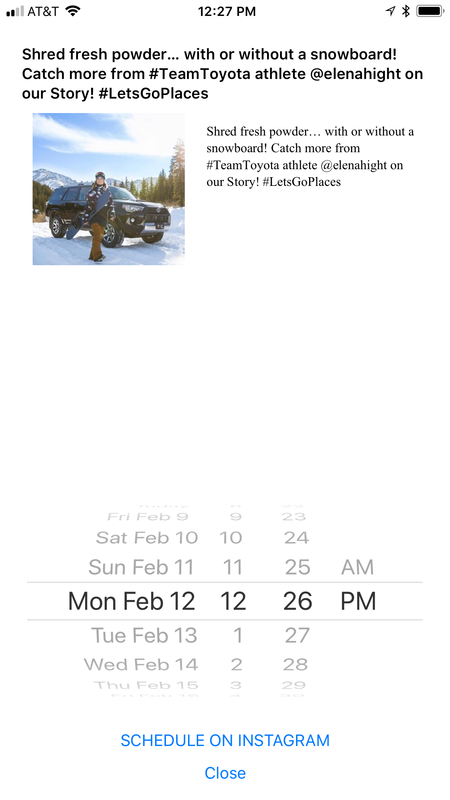 SimpleFeed’s white label iOS and Android Apps make it easy for distributed organizations to schedule or immediately publish to Instagram. To help corporations understand their most effective content on Instagram, and how it compares with other mobile and social platforms, SimpleFeed’s Social Syndication Hub aggregates analytics across all mobile and social channels. “We worked with our customers to address their challenges in scaling Instagram in 2017,” said Mark Carlson, CEO of SimpleFeed. “With Instagram being a top priority for Brands and Media Companies in 2018, we are excited to help others connect with the vibrant Instagram community. Many enterprises have image and video assets distributed across their web and social sites. Leveraging those assets to additional channels creates aggregation, curation and rights management challenges. Instagram publishing is more time-consuming than other social and mobile channels. For companies who distribute their products through partners, keeping Instagram presences genuine and authentic presents additional problems. SimpleFeed’s Social Syndication Hub is a predictive publishing service that automatically integrates and predicts what content companies should publish and where and when they should publish it to get optimal results. With the Social Syndication Hub, companies benefit from innovative algorithms that distribute content to ideal channels based on type, keywords, and categories, boosting lead generation, engagement, and conversions. Since Instagram is integrated into the SimpleFeed Social Syndication Hub, it is easy to run web, social, mobile and email campaigns promoting your Instagram presence. Global 2000 companies use SimpleFeed to massively increase the distribution of their content, enabling them to better serve customers and reach new prospects. From its start in managing RSS Feed programs in 2004, to predictive publishing for Social Networks to today’s emphasis mobile application publishing, SimpleFeed helps its customers win through content syndication. The SimpleFeed Social Syndication Hub automates the manual process of gathering real time content (Web, RSS, CMS, Blogs, Social Posts, Videos), publishing that content to thousands of syndication endpoints, and measuring the results of these campaigns and programs. SimpleFeed sells directly to Global 2000 companies and is offered through leading email service providers, advertising agencies, and marketing services companies. SimpleFeed is located in Menlo Park, CA. More information is available at www.simplefeed.com and @simplefeed.